Norman Reedus was born in Hollywood, Florida, United States, on January 6, 1969, is an American actor. 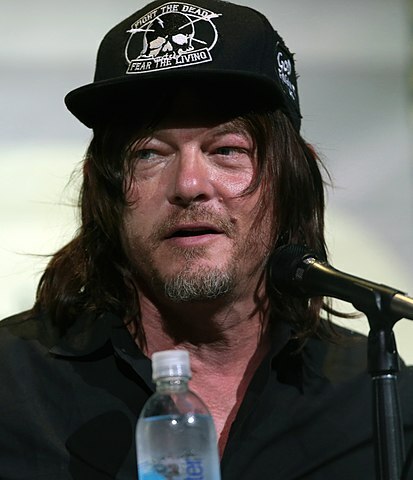 Young Norman Reedus began his acting career on stage in a play Maps for Drowners at the Tiffany Theater on Sunset Boulevard and as a model in the 1990s. He made his big screen debut in the science fiction horror film Mimic (1997) in role as Jeremy. Norman's breakthrough role came as Murphy MacManus in action thriller film The Boondock Saints (1999), he played the same character in sequel The Boondock Saints II: All Saints Day (2009). He's playing Daryl Dixon in the AMC post-apocalyptic horror television series The Walking Dead, since 2010, for which he was nominated for a Saturn Award for Best Supporting Actor. Hero Wanted (2008) thriller with Ray Liotta and Cuba Gooding Jr. He voiced Frank Castle / The Punisher in film Iron Man: Rise Of Technovore (2013). He has 9 tattoos on his body. Friend with singer Paul Banks and actresses Melissa McBride and Emily Kinney. He is also a painter, sculptor and photographer. He was in relationship with supermodel Helena Christensen (1998–2003), they have a son. He started dating actress Diane Kruger in 2016, they have one daughter. Close friend with actor Andrew Lincoln. He started a travel show Ride with Norman Reedus in 2016. Lives in Manhattan, New York City, New York, U.S. I followed a girl I met in Japan to Los Angeles and ended up working in motorcycle store. I quit the job one night, went to a party in the Hollywood Hills and ended up yelling at a bunch of people. Someone saw me yelling and asked me to be in a play. The first night, there was an agent in the audience who took me on and sent me out for jobs. Oh I love horror movies, yeah. I think my favorite movie growing up was 'The Omen.' I actually wanted to be that little kid. I'm still insecure, but when I first started acting, I was really insecure. I glared at a lot of people. I assumed everyone hated me. Somehow that scowl has turned into an acting career. I don't have a mullet, but going into season one on 'The Walking Dead,' I asked to have a mullet, and everybody talked me out of it. Because I'd have to wear a mullet when we were not shooting every day. I have that motorcycle, wings on my vest, the crossbow... Maybe a mullet would've thrown me over the edge. I’m a quiet person. I spend time observing, not speaking. My twenties were carefree in the worst ways. There's a nice balance now of work ethic and healthy lifestyle and carefree attitude, which is pretty nice. You get to a point where you don't care so much what people think of you and you care more about yourself.